EarlyComputers: The LAN-ALOG Analogue Computer Handbook. 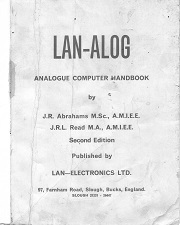 This handbook shows how to use the very rare LAN-ALOG computer made by LAN-Electronics in England. This is a scan of the Handbook and was originally printed in August 1968 (second edition). The authors were J.R. Abrahams of Mohawk College in Hamilton, Ontario, Canada and J.R. L. Read of Enfield Collect in Enfield England. Unfortunately, we do not know who sent us this scanned copy of the handbook. If you have any information on the handbook, please let us know.